Did you know that office buildings account for 22 percent of greenhouse gas emissions in New York State? Do your part to protect the environment (while saving yourself some money) by installing solar panels. Solar panels are unobtrusive and are installed flat on your business’s roof. Because they sit directly on low-profile aluminum brackets, rodents can’t get in and cause damage. When you call a pro to install solar panels, they’ll be quickly and easily installed due to their simple design. Because they can protect against water damage and rodents, solar panels can actually make your roof last longer. Solar panels reduce your business’s reliance on electricity. In some areas where electricity costs are high, commercial solar panels can provide a return on investment in just three to five years. Tenants and customers will see and appreciate that your business is going green by using renewable energy. The public image boost might even lead to increased sales! Get solar panels installed today to reduce greenhouse gas emissions and invest in the future of the planet, while also investing in the future of your business. 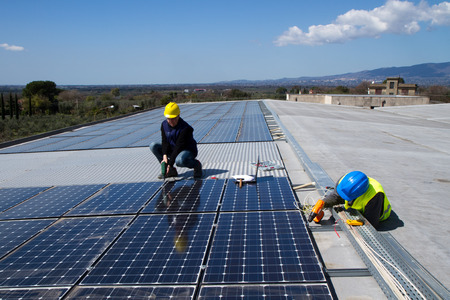 Ready to take advantage of commercial solar panels for your business? Contact Empire Clean Energy today at 631-589-4340. Let us take care of all your renewable energy needs!